This newly updated CDA North Condominium has a spacious fourth floor deck, as well as an indoor pool and hotub, with views of Lake Coeur d'Alene, surrounding mountains, downtown Coeur d'Alene (5 star resort two short blocks away), and City Park. Enjoy your front row seat to the Ironman competition and July 4th fireworks display. 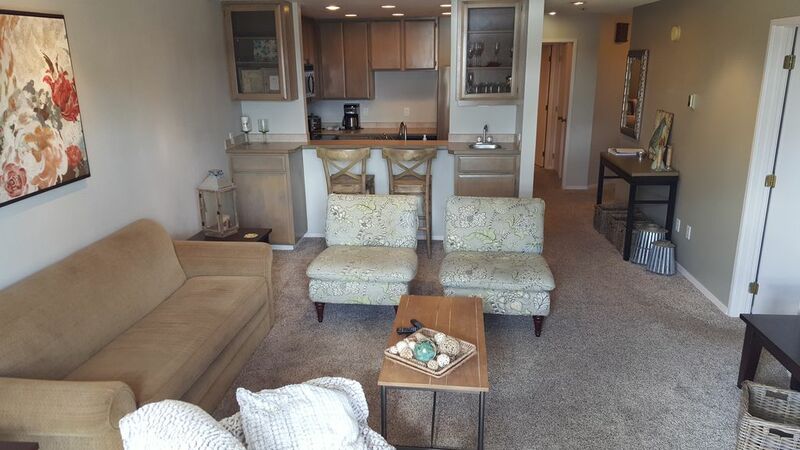 This condo is centrally located to all Coeur d'Alene has to offer! For more information, please contact Shawn or Jennifer via email. Our condo has everything to offer in location and amenities. The property is at the heart of downtown Coeur D'Alene ID, including two short blocks to the 5-star Coeur D'Alene Resort, City Park, Public Beach and the start of the Ironman competition. Relax in the Condominum's indoor pool and hot tub, or the spacious deck overlooking Coeur D'Alene lake and the 4th of July fireworks display. We stayed for 3 months and loved it! We walked everywhere downtown: lots of restaurants, bars, shops, Tubbs Hill etc. The condo has tennis, fitness, ping pong, pool, sauna, jacuzzi. And Condo evens comes with rackets, paddles and associated balls. Also everything for the beach. We would love to come back. Thanks for your comments Cathy! Looking forward to having you stay again with us. The beds and family room seating were comfortable, the large deck was nice, but the kitchen accessories were a bit limited. It was a great hang out for the family during the race and very convenient for racers. It was walking distance to many shops, restaurants and bars. There were 2 fabulous playgrounds for kids very close (walking). The secure, underground garage parking spaced were great. We enjoyed the pool, hot tub, ping pong and tennis court. Shawn was a very responsive host and always answered questions promptly. He was very flexible with checkin and checkout. Coeur d'Alene was a nice little town. We did parasailing, zip lining, hiking, swimming, biking, Silverwood, an alpaca farm, and lots of eating out while we were there. We recommend this place to anyone wanting to visit the area! The location and views were excellent. It was interesting seeing a blood red sun and moon while there too. Fabulous Fourth of July Stay!!! Wow! The location...the space...the owner - could not have been more wonderful for our recent family gathering in CdA for the Fourth of July. One can see the fireworks right from the HUGE outdoor deck. The facility includes pool, ping pong, tennis, kayak, bikes....all set up with convenience and family fun in mind. Owner (Shawn) was kind, diligent and professional EVERY STEP OF THE WAY! Thanks for a phenomenal stay! We have stayed in this condo for 6 - 8 weeks over the holidays (November/December) for the past 2 years and it's perfect. The location, the view, Amenities and working with Shawn is what keeps us coming back. If traveling to Coeur d'Alene I would recommend staying in this condo versus a hotel for the convenience of a large deck with BBQ, kitchen, and workout facility. Arrived from overseas to participate in the full Ironman. The location could not had been greater, from the amenities, nearby restaurants and the race start just a few steps away made Shawn's condo the place to be. The conmfy beds, equipped kitchen and tv's in each room watching the Rio Olympics also made me want to stay in all day long. The view is magnificent and the patio overlooking the lake took my breath away. Shawn thanks for such an amazing stay and looking forward to book again but next time will definately will be for vacations with the entire family!! First time visit to the northwest. My son lives/works in Spokane so we decided to stay in Coeur d'Alene. Condo is well kept and the location is perfect to explore this scenic area. Shawn was a pleasure to work with and kept in close contact to assist in any needs. 5-star Coeur D'Alene Resort and Public Beach only 2 short blocks away.